Image of Ganesha in yoga represents the force in the universe that removes obstacles and transforms our ego and pride back into love. It is my experience that we humans need all the help we can get on our journey into marriage, committed relationships, and deep human connections. When we allow ourselves to love fully, or fall in love, our hearts are so wide open and vulnerable that if we don’t set our intention to see the “truth” behind our actions we can easily begin to blame our partner for our pain and discomfort. Our unconscious patterns are sneaky, and before we know it our partner can be a catalyst for us, and trigger our unconscious wounds. Put another way: they help reveal our “shadow” side to us. Dr. Robert Augustus Masters says it this way, in his audio program, Knowing Your Shadow. What I mean by our “shadow” is whatever in us we are disconnected from or out of touch with, whatever we have disowned in ourselves, whatever we have not illuminated or will not illuminate in ourselves, whatever in us we are keeping out of sight. So our shadow is that zone of us which houses what we have not faced or can’t/ won’t face about ourselves. To the extent that our conditioning (especially that originating in our childhood) is allowed to run us, it is our shadow. Or put another way, to the extent that our conditioning is kept in the dark, it is our shadow. If we are to truly evolve, we need to know our shadow, and know it very well; if we don’t, our shadow will direct our lives on every level. In the yoga practices we have many techniques to bring ourselves back to love, to the moment, and to truth by focusing on our bodies and breath as a focal point of meditation. We also use mantras to focus our minds and set our intentions. A mantra is a sacred utterance, numinous sound, or a syllable, word, phonemes, or group of words believed by some to have psychological and spiritual power. Mantra may or may not be syntactic nor have literal meaning; the spiritual value of mantra comes when it is audible, visible or present in thought. A simple and powerful mantra to invoke the spirit energy of removing obstacles to love is the Ganesha chant. “Ganesha” is the Hindu deity in a human form, but with the head of an elephant which represents the power of the Supreme Being that removes obstacles and ensures success in human endeavors. Ganesha is also the destroyer of vanity, selfishness and pride. He is the personification of material universe in all its various magnificent manifestations. 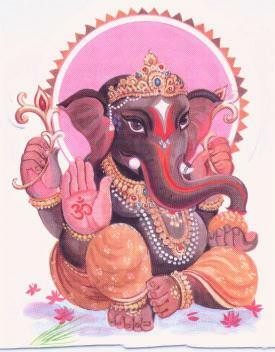 One chant to Ganesha is, “Ganesha Sharanam, Sharanam Ganesha,” which simply means: praises to that force in the universe that can help me remove these obstacles! I want to BE and experience the love that I am made of, and remember to return to it as much as possible for the rest of my life.